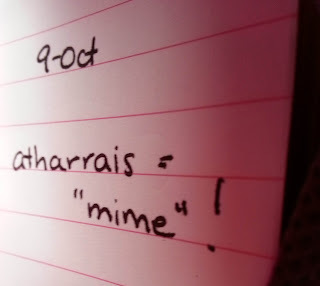 Last night in Gaelic we learned an obscure word - 'mime' (can't remember it now though!). Today I put on a black and white stripey top over the dress and paired it with black and white stripey knee socks... I must've had miming on the brain! I'm also wearing pink ballet tights under the socks (it's getting so cold!) and black flats. 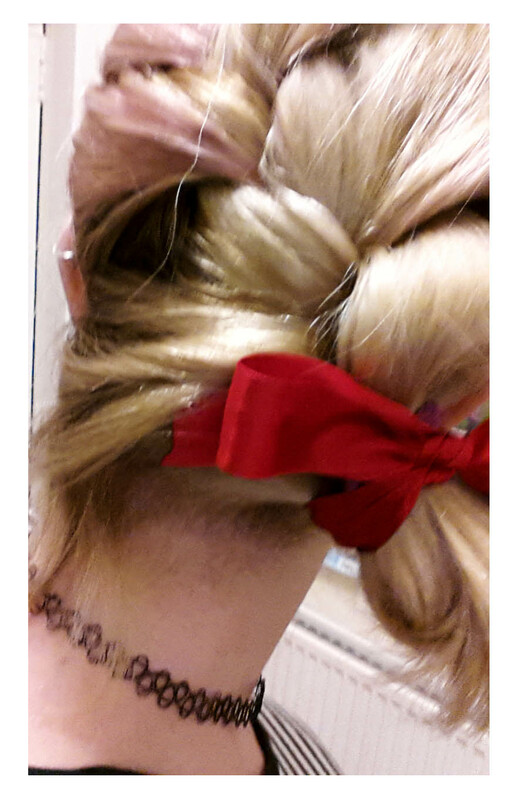 My hair is in a chunky side French braid and tied with a red ribbon. After all, why should school girls get the monopoly on wearing ribbons in their hair? I like ribbons! 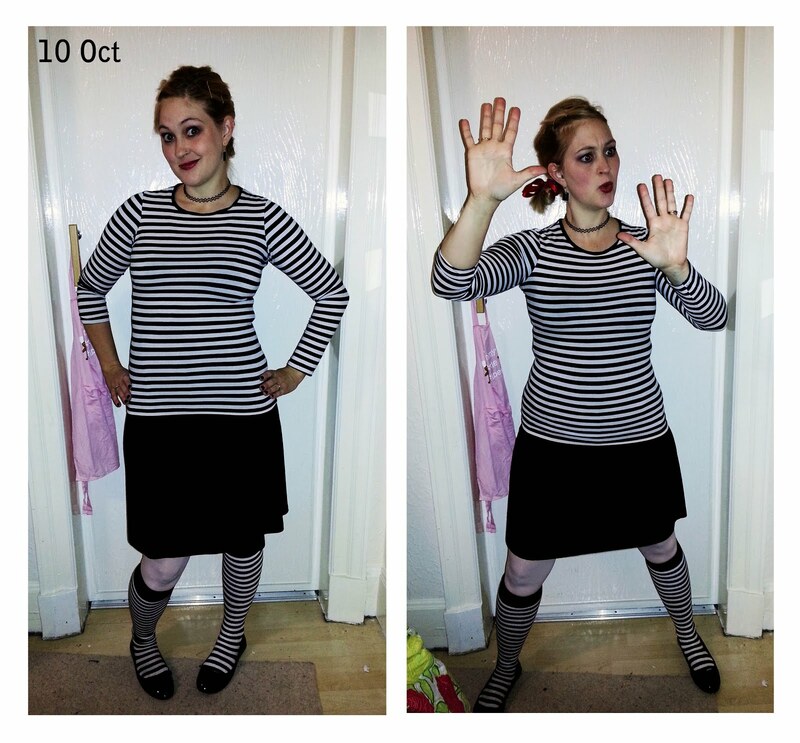 Going with the 'mime' theme, I even 'dramatised' my makeup, trying to pull off the mime-iest look without actually painting my face white. So thick black eyeliner and red lips. And goofy faces. You see, for me, mime isn't actually all that strange. Aaaaand cue seamless segue into a memoir. 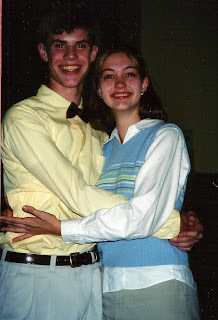 In high school, I was in Forensics. I wasn't great at many events, but I was not bad at Improv, winning a few trophies here and there, and I was embarrassingly good at Mime. 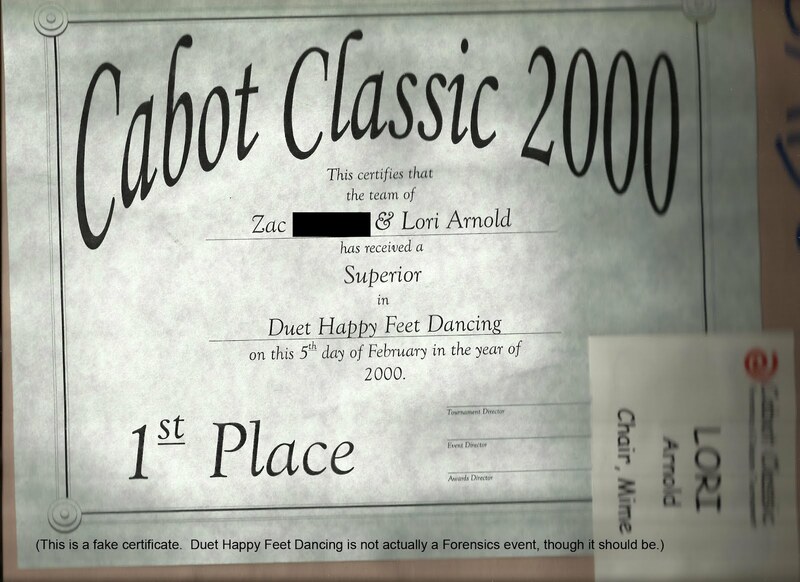 In fact, Zac and I were mime partners in high school and won quite a few trophies, including second place at the State Competition one year. 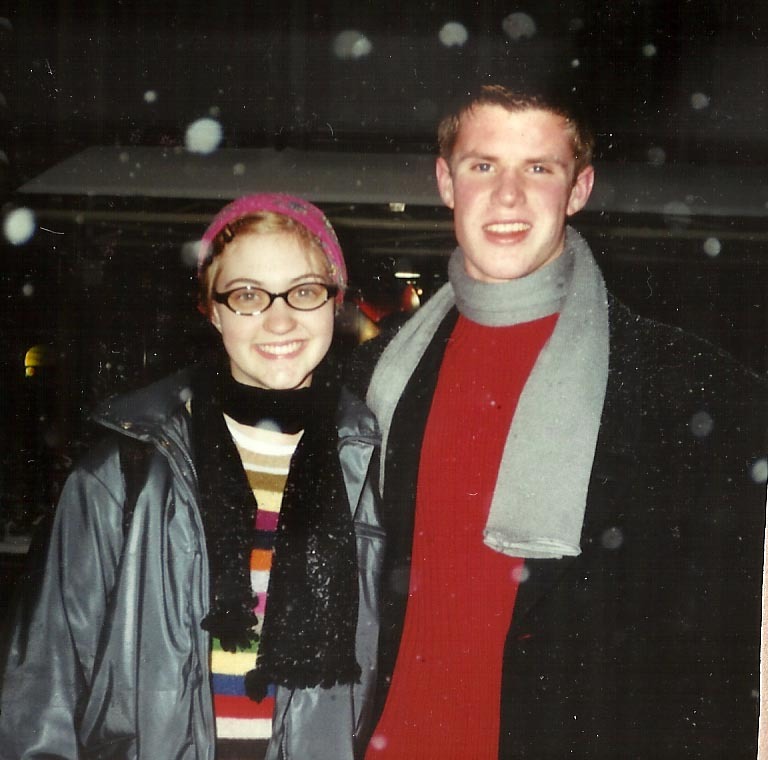 (Ohhh, I'm so embarrassed to be sharing this.) Zac and I had a few defining characteristics: Zac's bowties, our mini-disc player for music (instead of everyone else's tapes and tape players - lameos!) (I'll let you decide who the real lameos were), and our tendency towards pathos. and the photo from his dream is there. And yes, all that was in mime. And it was understood. And it won second place in the State. Real mime artists tell stories, not climb ropes. 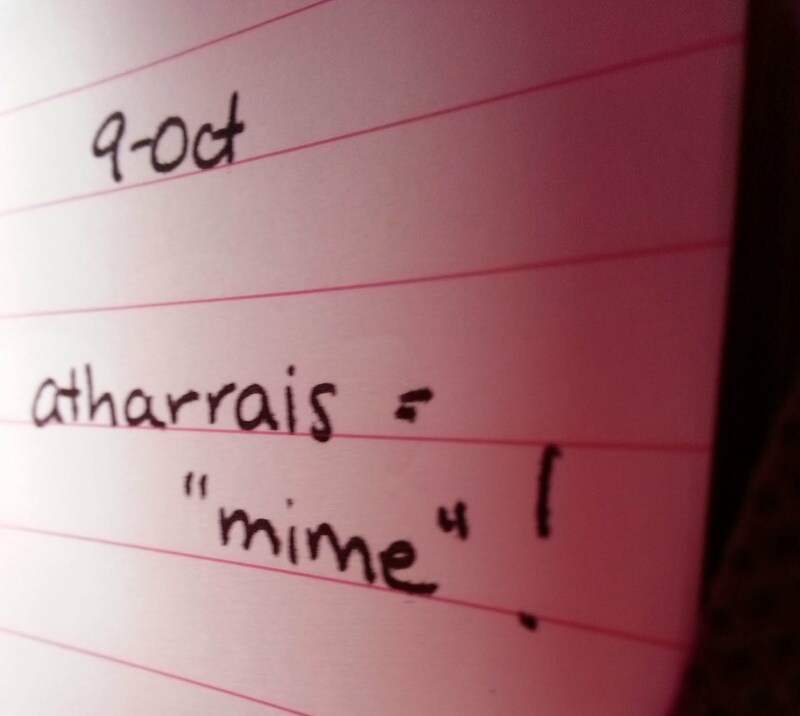 Found the Gaelic word for 'mime' in my notes!